Not only were fans enjoying the festivities of the Lay's NHL All-Star Jamboree Thursday, but Montreal Canadiens General Manager Bob Gainey was also spotted taking in all the sights and sounds. 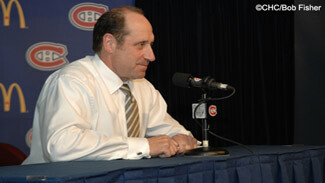 "For us to have the All Star Game here in Montreal is a great celebration," Gainey told NHL.com. "I know the people here and anyone from outside the area have been excited about it. And why not? We've got a great venue and lots of places for people to stay in the downtown core of Montreal to enjoy the weekend." Gainey fondly recalls the All-Star Game at the old Montreal Forum in 1993 and how the excitement for this game has been building. "The one thing that sticks out in my mind from that '93 Game was how bloody cold it was that weekend," Gainey said. "The weather this year is balmy compared to then. I hope it stays like this so that people can get out and around the city. Montreal likes to celebrate that Latin culture. They like to have fun things to do and this is a way for us to celebrate what we feel is our national team and our national sport." Gainey said his two daughters will also be assisting the League during NHL All-Star Weekend. "I've got two daughters who live here in Montreal and they're working as volunteers in a couple of different places at different venues over the weekend," he said. "I think they're hoping to be able to get a spot inside the arena for one of the events." MONTREAL -- They came in droves on Thursday to a parking lot transformed into a marvelous big top tent right across from the Bell Centre and Windsor Station in downtown Montreal to exult, compete and perhaps catch a glimpse of a few NHL superstars. Truth be told, all those hockey-crazed fanatics partaking in the opening of the Lay's NHL All-Star Jamboree to officially kick off NHL All-Star Weekend were not disappointed. "I was invited for this event and it's amazing because it's the 100th year of the Canadiens and I think everybody is so excited," said 21-year-old Lukas Brouin of Montreal. "All the NHL players are excited to come and I think it's a nice event to be a part of, especially if you're a Canadiens fan." There was the Honda NHL SuperSkills Games for fans of all ages, a tremendous NHL Trophy display that included the Stanley Cup, an X-box interactive gaming zone, an opportunity for those seeking autographs of NHL players and the NHL All-Star Trading Card & Memorabilia Show presented by Upper Deck & McFarlane Toys. Quite simply, a little bit of everything for even the most casual fan. Vince Lee was taking numerous pictures of the trophies and jerseys on display. "It's been a long time since we hosted the All Star Game and I don't know if it's going to be a coincidence or not, but the last time we hosted was the last time we also won the Cup," the 25-year-old Montreal native told NHL.com. "I'm hoping it happens again during our 100-year celebration. It will mean everything to this city." Ironically, the 1992-93 season also marked the 100th anniversary of the Stanley Cup. Gregory Vadnais was impressed with the Gatorade Shoot & Score within the SuperSkills area. "It's a lot of fun and I'm trying all these activities," Vadnais, 21, said. "I didn't expect this Jamboree to be this big, but it's very cool. They should do this every year in Montreal. I'll be coming back. I do have tickets to the practice on Saturday morning and I plan on getting there early with my friend. It's going to be a lot of fun." In addition to the Shoot & Score interactive element, fans were given an opportunity to test their hockey skills in the McDonald's Hardest Shot, Scotiabank Pass & Score, Cisco Be a Goalie, ConAgra Breakaway Challenge and the Bridgestone Accuracy Challenge. Brouin enjoyed his shot at being a goalie. "I think the one thing that impressed me most was when you dress up as a goalie and receive the shot," he said. "I was so impressed with how fast the shot goes. It's nice to try the target shooting and hardest shot too. You don't ever get to do this kind of stuff so it's really neat." In addition to milling around the trophy area, Lee was also checking out a new interactive area where kids were able to measure the size of their hand and foot against some of the NHL's top players. "It's nice to see Carey Price getting the start for the Eastern Conference," Lee said. "He's one of the better goalies in the League and hopefully he can help bring the Cup back to this city. This Jamboree was very good because it gives the average fan a chance to come here and even touch the Stanley Cup. The setting is great; it's top notch." Two blocks down from the Jamboree tent and inside Windsor Station was the NHL All-Star Trading Card and Memorabilia Show presented by Upper Deck and McFarlane Toys. Artist David Arrigo was also there painting an All-Star legacy portrait spanning 12 feet by 5 feet. Arrigo, who began the painting on Wednesday, featured Price as the central figure. The Eastern Conference starter was surrounded by Montreal greats Patrick Roy, Ken Dryden, Saku Koivu, Maurice “Rocket” Richard, Serge Savard, Bernie “Boom Boom” Geoffrion, Bob Gainey and Larry Robinson. Arrigo's mural will be donated to the Sainte-Justine's Children's Hospital in Montreal. Tickets to the All-Star Jamboree cost $10 (Canadian) and are allocated through two-hour time blocks to control the ingress of people into the event. The Jamboree will be open Thursday (2-10 p.m.), Friday (2-10 p.m.), Saturday (10-10 p.m.) and Sunday (10-6 p.m.). A section of the Jamboree will be unavailable on Sunday due to private events, so ticket prices will be reduced to $8. A portion of the proceeds from the All-Star Jamboree will go to Hockey Fights Cancer within the Montreal community.